Facebook's solid earnings report suggested that the other FANG stocks might have a future, too. The market needs these reminders every once in a while. The entire group of so-called FANG stocks jumped in unison on Wednesday morning, all thanks to one of their number presenting a strong earnings report. Following a strong third-quarter showing by Facebook (NASDAQ:FB) -- the "F" in FANG -- the other letters of the acronym followed the social network's stock with positive jumps of their own, sometimes even ascending above Facebook's 7% maximum gain. Amazon (NASDAQ:AMZN) enjoyed a 6.1% lift at most, Netflix (NASDAQ:NFLX) shares jumped as much as 9% higher, and Google parent Alphabet (NASDAQ:GOOG) (NASDAQ:GOOGL) saw both of its share classes topping out at roughly 4.9%. To be clear, Facebook was the only company in this group that had any significant news to report here. Amazon, Netflix, and Alphabet already reported their respective results for the third quarter, and none of them had any significant product launches or fresh analyst reports to lean on. The closest thing to an independent trigger event came from Amazon, which partnered up with Western Union (NYSE:WU) to launch an international payment system. But given that Western Union's shares rose no higher than 2.6% on this news nugget and that the partnership probably holds more weight for the smaller partner anyway, I'm going out on a limb here by assuming that the Western Union deal wasn't a major driver behind Amazon's jump today. So this was Facebook's doing. The company's third-quarter sales rose 36% year over year to $13.7 billion. Earnings grew 10% larger, landing at $1.76 per share. Your average analyst had been looking for earnings near $1.47 per share on revenues in the neighborhood of $13.8 billion. That was good enough to spark a bounce in Facebook's stalled stock chart, letting all of its FANG friends ride along on the company's coattails. Investors in Facebook, Amazon, Netflix, and Google/Alphabet will have to keep looking for good news for a while. 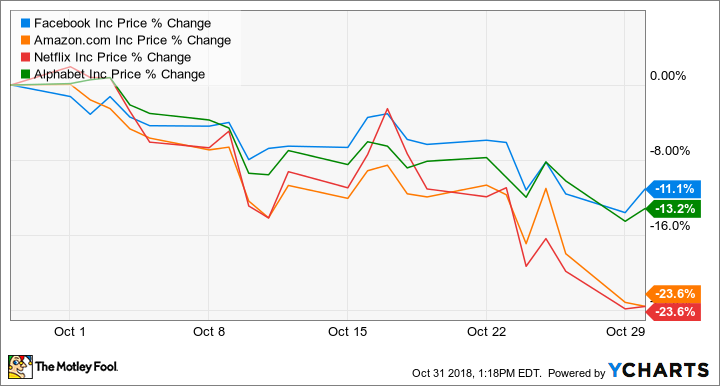 The market's generally unsettled temper isn't doing these stocks any favors since the whole concept behind the FANG grouping is a high-octane type of growth investments with little love from the traditional value-hunting community. Many investors see more risk than reward in these stocks, making them vulnerable to sudden bouts of volatility. That's what's going on today. Facebook's good news gave all of the FANG stocks a boost, making up for some but not all of this month's downward volatility.